Clodius Albinus, was born at Adrumetum in Africa. The Emperor Commodus made him governor of Gaul and afterward of Britain where he was at the death of Commodus in A.D 192. In order to secure the neutrality of Albinus, Septimius Severus made him Caesar ; but after Severus had defeated his rivals, he turned his arms against Albinus who was defeated and killed the 19th of February, 197. Obverse: D CLODIVS ALBINVS CAES, bare head right. Reverse: PROVID AVG COS, Providentia standing left, holding wand in right hand over globe to left, leaning on scepter in her left hand. Obverse: D CLOD SEPT ALBIN CAES, Bare-headed bust right, with drapery on far shoulder. 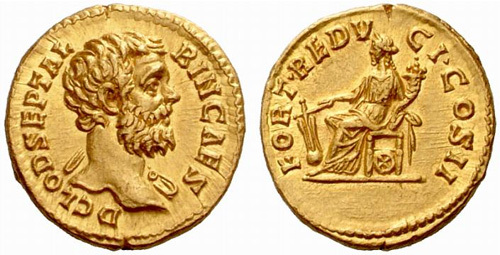 Reverse: FORT REDVCI COS II, Fortuna seated left, holding rudder on globe and cornucopia; wheel under seat. Obverse: D CLOD SEPT ALBIN CAES, Bare head right, drapery on left shoulder. Reverse: SAECVLO FRVGIFERO COS II, Saeculum Frugiferum standing left, radiate and bare to waist, holding caduceus and trident.